I've always been a big fight fan. 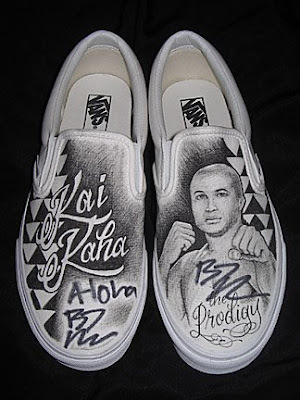 I made up some shoes and BJ Penn was kind enough to sign them. These shoes will be up for auction to help out Stephen Murray. More details to come on that. and a pic of me and BJ. Yes, i am super stoked to meet him, i just had a rough night. Shoots and mahalo, B.I.G.